WHAT does it take to successfully manage an integrated development or a transit-oriented development? Malaysia can perhaps learn much from its neighbour down south. As Malaysia sees more integrated and transit-oriented developments (TODs), there is a need to look into the resources and skills required for the long-term management and maintenance of these multi-functional projects. Taking a leaf out of the Lion City’s book, the president of Singapore’s Association of Property and Facility Managers (APFM) Dr Lim Lan Yuan notes that managing a multi-functional project is different from a single-purpose development. “One basic difference is the type of occupiers, which is more homogeneous in single-use developments than in mixed developments, hence the need to strike a good tenant or trade mix in a mixed development,” Lim tells EdgeProp.my. Lim, who has over 40 years’ experience in managing mixed developments including TODs in Singapore, defines a TOD project as essentially a higher-density mixed development focused around a strategic point in a transit network that makes accessibility convenient. It provides integration with and access to a transit station, supporting a right mix of land use and density, and creating a walkable environment around it. As such, in contrast to a single-use development, the integrated project requires a multi-pronged and multi-approach perspective, Lim adds. One area that TOD operators and managers need to pay attention to is the integration of activities within the project in order to develop engagement with the public. 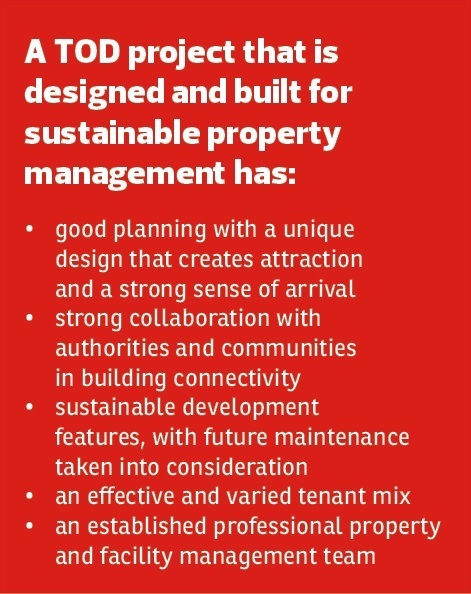 Lim stresses that successful property management of TOD projects or mixed-use developments starts from the developer’s blueprint right from day one, because the property management team is usually not involved in the early planning and design stage. “If insufficient thought is given to it [TODs and mixed developments], then the subsequent management will encounter problems that may not be easily rectified. “Besides the master plan, the facilities and services planning is also very crucial,” he notes. For instance, he says, in a TOD project that has four different components — residences, hotel, shopping or retail podium and offices — the developer should decide whether these components will be retained for occupation and investment, or whether part of the development, say, residences, will be sold. “The design for the residences should be such that they can be managed independently from others. [The developer] also needs to consider whether a separate title for the residence component can be issued. If not, the design needs to cater for separate entrances and exits as well as management control for its residential component. “While the aim is to provide an overall integrated management for the TOD project, a separate management might have to be considered if a component is strata-titled and sold,” he points out. Nevertheless, he acknowledges that the critical consideration is integration rather than having a few separate stand-alone operations. “While a centralised management structure with different departments and sections, with management personnel, equipped with different skill sets may be required, the specialised outsourced services will need to be coordinated,” he adds. In view of the large-scale and complex operations in TODs or mixed developments, there is a need for adopting technology in management. A building management system, building automation system and other management systems are a must for efficient and ease of management. 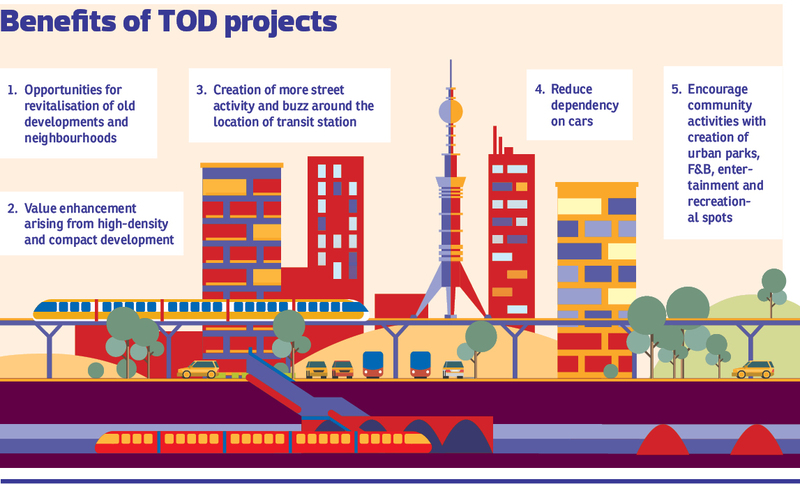 Although Lim agrees that the features of TOD projects vary depending on whether they are located at the inner city or suburbs, all TODs should be place-making projects, regardless of its location. This will require a property developer to do more than a property manager, especially in the early planning stage. “There are a few areas that a developer needs to consider in making a TOD project an easy-to-manage place-making-oriented project, such as to ensure a right balance of buildings and spaces for activities in the location. The developer has to integrate the TOD project with the surrounding streets and neighbouring environment,” Lim shares. It is also important to have effective parking and traffic route management for cars, motorcycles, bicycles and other vehicles, as well as convenient pedestrian connections and accessibility to the mass rapid transit or light rail transit stations and nearby neighbourhoods, he adds. This will also help the property manager in controlling footfall and traffic in the future. This story will appear in EdgeProp.my pullout on June 22, 2018. Download EdgeProp.my pullout here for free.